Wandering and Wondering: Is That The Sun? The river is on it's way down at the folk's house, though the forecast is to rise again in a day or so. Apparently we are playing a weird game of River Yo-yo. Dad thinks it's amusing but Mom isn't quite as enthusiastic. She can't swim, so was very anxious about buying a home so close to a river. That was 40 years ago. "What if I fall in?" she asked my dad. "Don't worry about it," answered Dad, "It will probably just come up and get you!" Along with de-cluttering, we are also repainting all the interior of the house. We have surrounded ourselves with bright colors and murals. We've loved them and our grandchildren loved them but we are really looking forward to creating a neutral zone. It's hard to just sit and veg-out when everywhere you look there is something to look at! Does that make sense? So, in the middle of caring for aging parents, physical therapy for torn rotator cuff, back fence blown down and extremely damaged pergola, we are going to paint. Please do not make any 'head-examined' comments, we've heard them all! I thought I might post some of the Before shots and then, as we ponder, purge, and paint, we can share the progress. Two walls are this melon color. 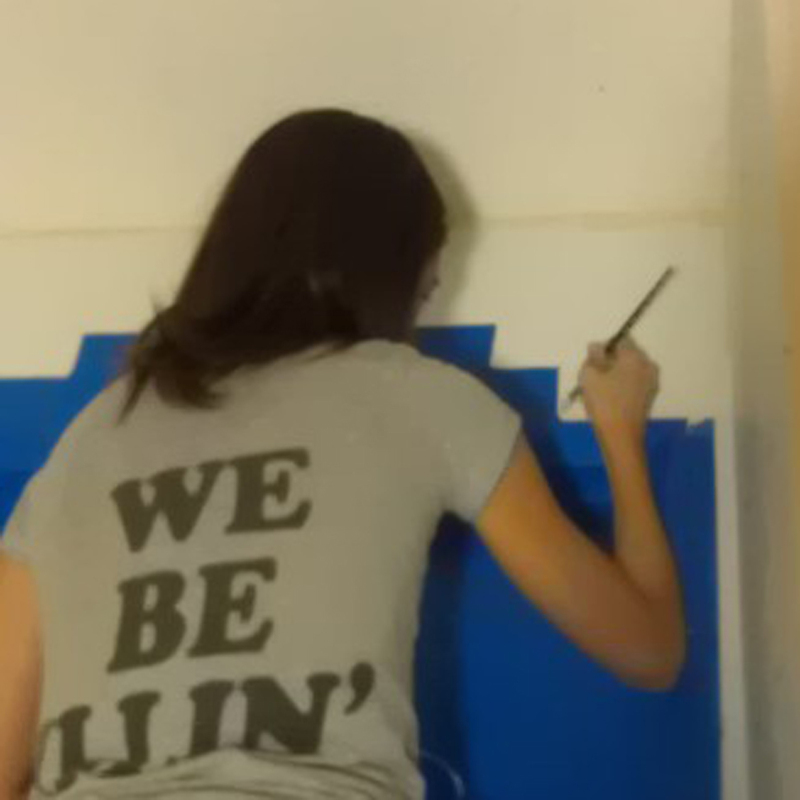 Was nice for awhile but we are painting the walls, including the mural above a very light grey. The long, high wall will remain white, as will the trim. The books in the case are double thick, so will be purging, purging, purging. Anyone want some books? The fireplace is double sided, in both the living room and family room. We are painting this monstrosity a soft white, grout and all. I can't wait!!! 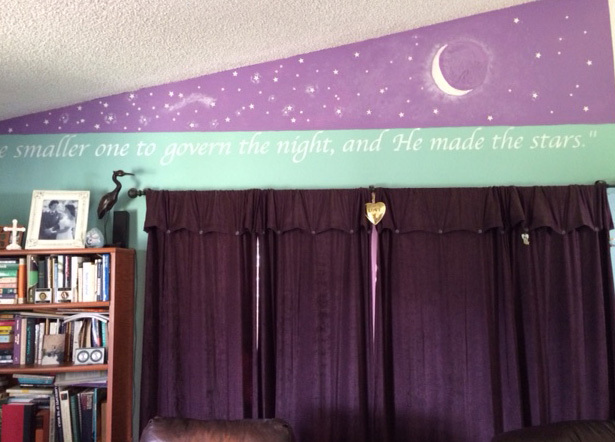 The mural on the side wall reads, "And He made the stars." 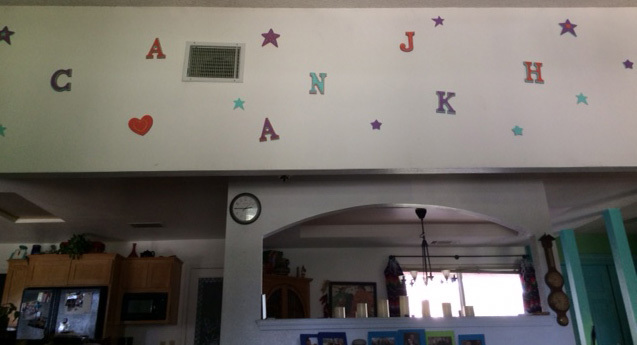 We decided to put our grandchildren's initials up with some stars so they knew that we felt that they were some of the stars! They are all getting pretty old, so I don't think they'll even notice the letters, stars and hearts missing. 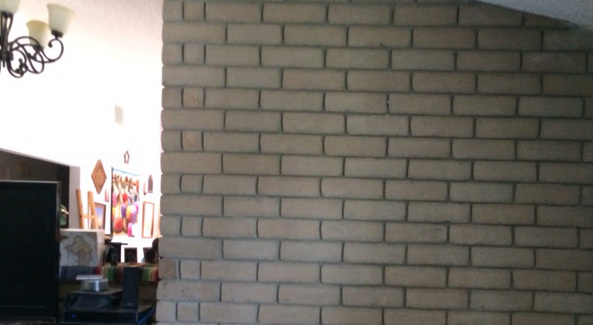 This wall stretches across through to the living room and will be painted the same soft white as the bricks. When I was drawing this tree out on a sheet of paper, the tree was originally a deep green. My granddaughter, Alaina, who was about 8 or 9 at the time, saw it and said, "Oh, Nana. There are enough green trees in the world already. That one should be purple!" And, so it is! Alas, time to say goodbye to the tree and the leaves. Pretty sure this wall will be white and I will fill it with family photos which are taking up much of the surface space on tables, piano, shelves, etc. 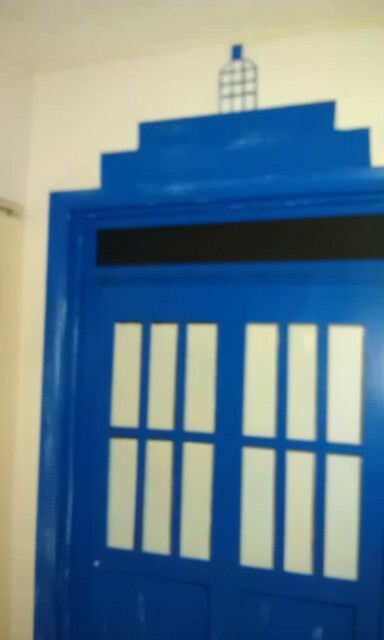 I've decided to keep the Tardis door to my studio. Two of my granddaughters helped me paint it and I love the line, "It's much bigger on the inside than the outside!" from Dr. Who. Dang, I spent so much time on this post, I'm short on time to prepare bricks...looks like we'll have to order pizza for dinner! Always nice to freshen up one's environment. Love the blue doors! your local library will always take donated books. cannot wait to see the finished interior. We will be donating many to the public library. Frank is a passive reader. His books are pristine. I, on the other hand, have active conversations with my books. I underline, write in margins, ask questions and leave many sticky-note bookmarks with key words here and there and here! whatan interesting sharing dear friend!!! i loved insight into your house . your granddaughter 's imagination run brilliantly to draw tree purple instead of green.kids are far better in their creativity ! i actually liked the grey bricks though look dull but there must be some place in house like dim like this so when you look at this you can let your imagination run and create it's own marvels . I do love the purple tree. Reminds me of Alaina and her wonderful imagination. The color of the bricks is not a bad color, but that the grout is a different color. It makes for what seems as hundreds of rectangles which adds to the visual noise of the rooms. When we paint it, it will be just one color...one big giant brick! Who knows, once the walls are grey, they might beg for different murals once the craziness of our lives settles a bit. You can always just accidentally "drop" that clock when taking it off the wall. Drop it right on a hammer that will smash it a few times, if it's a particularly solidly-constructed clock. No one will suspect. Despite changing fashions, I have always loved neutral walls. I think the colour and texture in a room should best come from the furnishings. I'm sure you'll love your redo! There are a lot of white walls in my house to help balance the bright walls but I agree with you; the accessories and furniture can bring the snap to the room. Easily interchangeable too! Our daughter gave the clock to Frank. It is an automatic and atomic clock that coordinates itself to some clock in the mountains of Colorado. It's a geeky-techno thing that he loves so much, I'll probably just hang it in the garage above his workbench...on a very unstable nail! You are a busy bee! It's a lot of hard work but it'll be worth it in the end. I love neutral colours on walls and pops of colour from furniture/décor items. As I was commenting to Debra, I do have many white walls in the house to buffer the bright walls but am looking forward to the neutral. I'm already imagining art, pillows, rugs and slipcovers to add the zip! You are such talented, creative person. I understand wanting to declutter the walls, but those murals were fantastic. However, change is also good and I am sure you will enjoy the new look. My husband often remarks to people not to stand still too long in our home or I will paint them. I'm sure that it won't be long before the neutral walls inspire something new. Thank you for the compliment though, I truly appreciate it.